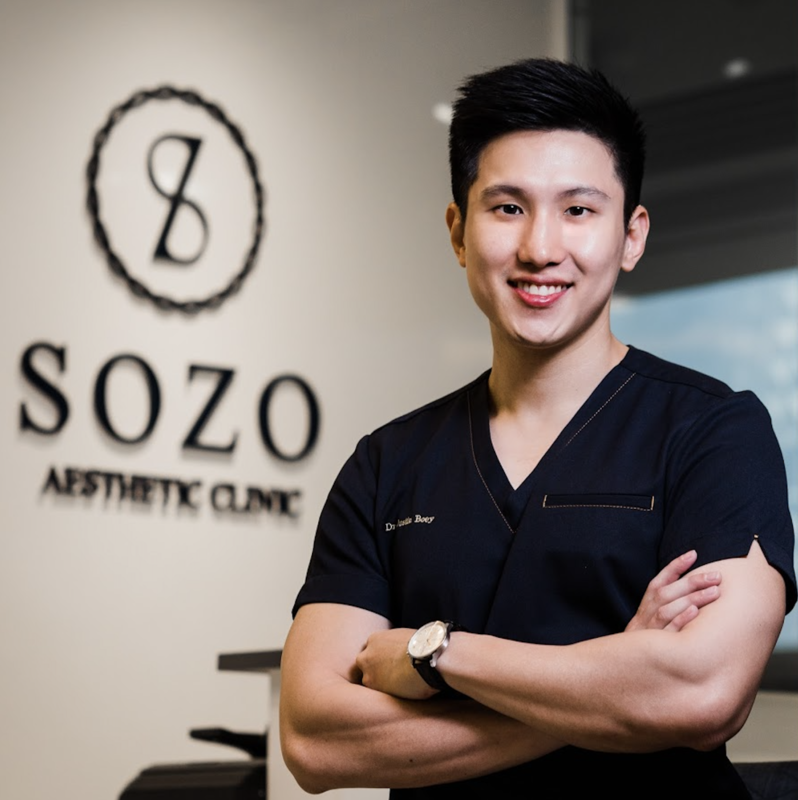 Dr Justin Boey (Sozo Aesthetic Clinic) specialises in Facial Aesthetics (Pigmentation, Acne Scars and Facelift) and Hair Loss. As a Regional Physician Trainer for Stylage Fillers and DermaSculpt Micro-Cannula (for Fillers and Acne Scar treatments), he is passionate about training fellow doctors in South-East Asia to bring Aesthetic Medicine to a greater level in the region. Having performed more than 5000 laser treatments, he is a Key Opinion Leader for Enerjet 2.0 for Acne Scar removal. He is a trail-blazer in Aesthetic Medicine in Singapore - being the first doctor in South-east Asia to offer Pico Plus laser and one of the pioneer users of Regenera Activa hair loss treatment in Singapore. Dr Boey is frequently featured in the media and magazines like Her World, The Peak and Female for his insights on Aesthetic Medicine. Dr Boey graduated with Bachelors of Medicine and Surgery from the National University of Singapore. He attained his post-graduate diploma from the American Academy of Aesthetic Medicine. He holds Certificates of Competence in Aesthetic Medicine and is accredited by Singapore Medical Council’s Aesthetic Practice Oversight Committee. He is one of few doctors in Singapore to be awarded Masters of Science in Aesthetic Medicine (Distinction) from Queen Mary University of London. Previously, he practiced at the National Skin Centre (Singapore) and underwent clinical preceptorships with leading specialists in Seoul, South Korea. Whilst training, he completed an elective posting in plastic surgery at Harvard Medical School’s teaching hospital, Beth Israel Deaconess Medical Centre in Boston. A firm believer in advancing techniques and technology, Dr Boey completed research stints at Imperial College London and the National Skin Centre (Singapore). His work on skin cancer was presented at the World Congress of Dermatology in 2015. An avid athlete and a Commando Medical Officer, Dr Boey believes in staying sharp through regular exercise. A perfectionist at heart, he combines a keen aesthetic eye and steady hands to achieve natural and harmonious results. "Steroid injection for large cystic acne pimple"
"HIFU Ultraformer + Botox results"
"Nose threads and fillers "
"Hifu treatment helped my saggy skin and puffy cheeks"
Not the review you're looking for? Browse other reviews tagged Acne & Scars Aesthetic Medicine Skin, Hair & Nails Hair Loss or ask your own question now FOR FREE. Dealing with acne in your youth is bad enough, but the scars left behind can be a real nightmare. This is why I have decided to write this article to help those of you who are struggling with acne scars. The best outcomes usually result from a combination of different methods, individualised to your skin type and scar! Here's what you need to know. Skin pigmentation is the bane of crystal clear skin! Those who have experienced it (some of them still continue to live it) are definitely well acquainted with its confidence-killing powers. Fortunately, Dr Justin Boey has dedicated his practice to wage war on these pesky spots. He has helped many patients restore their confidence by resolving their pigmentation problems! Thinning hair stems from many reasons and it can be really distressing. Patients who come to me are eager to seek ways to reverse thinning hair. However, despite their eagerness, many of them are still not keen on trying the traditional hair growth methods. Hair growth medicines comes with quite number of undesirable side-effects while hair transplant surgery is costly, and carries some risks. Thus, I wanted to write this article to share my knowledge on a new hair-loss treatment: Regenera Activa. We all know that intrinsic aging is a natural part of the aging process that reduces collagen and elastin production in your skin. When the natural elasticity is lost, it causes our skin to sag. The most common request I get from my patients is to help them keep their complexion looking young and fresh. I always tell them that to look youthful, tightening the skin on your face and neck is the first place to start. Watch the video to discover how I help my patients customise a treatment plan for their concerns. High Intensity Focused Ultrasound (HIFU) is currently one of the most effective and most sought after non-surgical treatments for skin tightening and face lifting in Singapore. With a large number of HIFU treatment brands and a broad range of treatment providers, I often get a lot of questions on the very varied pricing for HIFU treatments in Singapore. Hence, I've decided to write this post to help you understand the varying HIFU treatment prices, the effectiveness, and the safety concerns beyond the marketing hype. Not the question you're looking for? Browse other questions tagged Acne & Scars Aesthetic Medicine Skin, Hair & Nails Hair Loss or ask your own question now FOR FREE. What should I do to protect my skin after laser resurfacing for acne scars? How can I achieve glowing skin? Does aloe vera gel reduce or lessen wrinkles? Where can I buy Differin in Singapore? Differin is available in most GP clinics, Aesthetic Clinics and Dermatology clinics in Singapore.